The SD Association has made three important announcements in the course of the past couple of weeks. 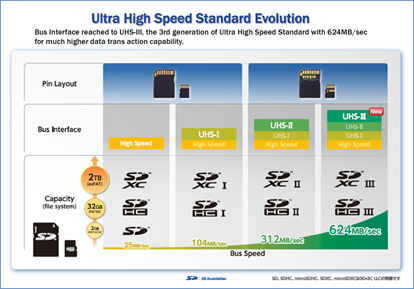 First is the introduction of its UHS-III bus that increases the potential maximum throughput of SD cards. Second is the announcement of the Application Performance Class 2 standard, for devices that meet a new set of criteria that relate to IOPS. Third is a new Low-Voltage Signaling specification (LVS) that has potential to reduce complexity and power consumption of future applications featuring SD memory cards. Both the A2 and the LVS are parts of the SD 6.0 specification. As 4K, 8K and 360° content are becoming more widespread, the performance requirements for storage on cameras and similar devices is ever increasing. To support them, the SDA is introducing a new UHS-III interface bus that increases potential read/write bandwidth up to 624 MB/s (double that of the UHS-II). The UHS-III high-speed interface signals are assigned to the second row of SD card pins that are also present on the UHS-II cards, which means that the upcoming UHS-III cards will be backward compatible with UHS-II and UHS devices as well as any other SD hosts. Since the SD Association only manages standards, it cannot make announcements regarding the availability of devices and memory cards supporting UHS-III. Given the fact that the new bus requires a redesign of SoCs currently in the market (the addition of a faster PHY may not be too hard from an engineering point of view, but it is time consuming), qualification and other efforts, it is logical to expect UHS-III applications about a year from now, if not later. Keep in mind that a couple of years passed between the announcement of the UHS-II and commercial availability of cards supporting the standard. The SDA expects the camera industry, as well as various emerging devices that need high data throughput, to adopt UHS-III first with others following sometimes later. Not many smartphones currently support even UHS-II, so it remains to be seen when mobile devices adopt the UHS-III. Last November the SDA introduced its Application Performance Class set of requirements for SD cards and kicked off with the A1 class that guarantees minimum write IOPS of 500, minimum read IOPS of 1500 and sustained throughput of at least 10 MB/s. Today, A1-compliant SD and microSD cards are on the market and are available from various manufacturers. At MWC 2017 the SDA expanded the application performance class with a new A2 rating. This rating requires SD cards to provide a random performance of 2000 write IOPS and 4000 read IOPS, while leaving sustained sequential read/write speed at 10 MB/s. The A2 Class is a part of the SD 6.0 protocol specification and this means that apart from higher random and sequential numbers, some of the A2 cards will are mandated to support such functions as command queuing (with a minumum depth que of 2 and maximum depth que of 32) and caching to hit the performance targets as well as 'self-maintenance' and low-voltage signaling (LVS). For example, command queuing could optimize random read performance, whereas support for caching could improve random write performance as SD cards can use higher-speed NAND flash cache to write data (in a manner similar to what TLC-based SSDs do with their pSLC cache). High-performance random writes are important not only for computer programs installed on cards, but also for devices that write data intensively (e.g., 360° cameras). The SDA does not explain much about the 'self-maintenance' element to the standard, but it says that it contributes to “better memory access performance” and allows “internal background data management.” In general, it looks like the upcoming SD 6.0-compliant cards will support some sort of garbage collection, akin to that performed by SSDs. 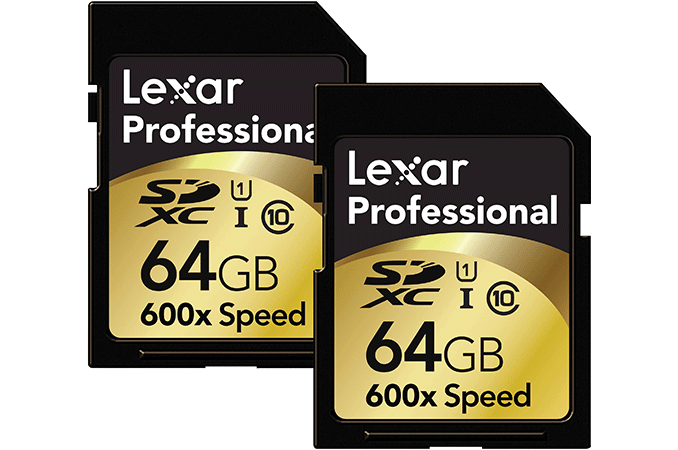 Keep in mind that some of the already available SD cards can hit the A2 performance requirements today. Update 3/12: The mimimum depth que that the A2 Class cards are mandated to support is 2 (not 1, as we were told at the time of writing, which essentially means that the tech was not used and all cards could "support" it). Meanwhile, the maximum depth que is 32 commands. Therefore, all the A2 Class cards will have to feature new controllers featuring Command Queue and Cache functions and that means the logotypes will not be put on existing products despite their compliancy with the performance numbers. That said, it will take some time before A2 Class cards hit the market. At present, multiple makers of SD cards are developing sampling their A2-rated products and it is expected that they are going to release commercial A2 products in the coming months quarters. Meanwhile, since command queuing and caching enable cards to hit the performance targets and are mandatory features, all A2 cards will come with this functionality. Keep in mind that today’s hosts do not support the SD 6.0 spec, so, certain cards with the A2 logotype may not demonstrate all of their advantages on hosts compatible with the SD 5.0 and the SD 5.1 specs. When the Secure Digital standard was designed in the late 1990s, the developers decided to use 3.3 V signaling because at the time it was considered low enough even for mobile devices. Eventually, the SDA added 1.8 V signaling to UHS and UHS-II modes, but kept 3.3 V signals for initialization and operations with legacy hosts. As a result, modern hosts also had to support both voltages. The SD 6.0 introduces low voltage (LV) signaling cards that need to support either 1.8 V or 3.3 V signaling with auto detection mechanism, eliminating any needs for upcoming hosts to support both and thus decreasing complexity and saving some power because of reduced signaling voltage. The new cards will carry the LV logo and will be backward compatible with existing hosts, but LV hosts will only work with LV cards. Despite the somewhat confusing mess surrounding SD cards, performance and metrics, the three announcements made by the SDA are independent of each other. Some new cards coming to the market will be UHS-III-only, some cards will be UHS-III with LVS, and others will be A2 with LV, others will be LV without A2. As always, host support will be critical. I've seen enough Real World test results far lower than advertised to "believe it when I see it"
I'll just leave this here, where it's easily seen: "/s"